Arroyo Seco Press presents Seventeen Poems Not About a Lover Chapbook Release party! 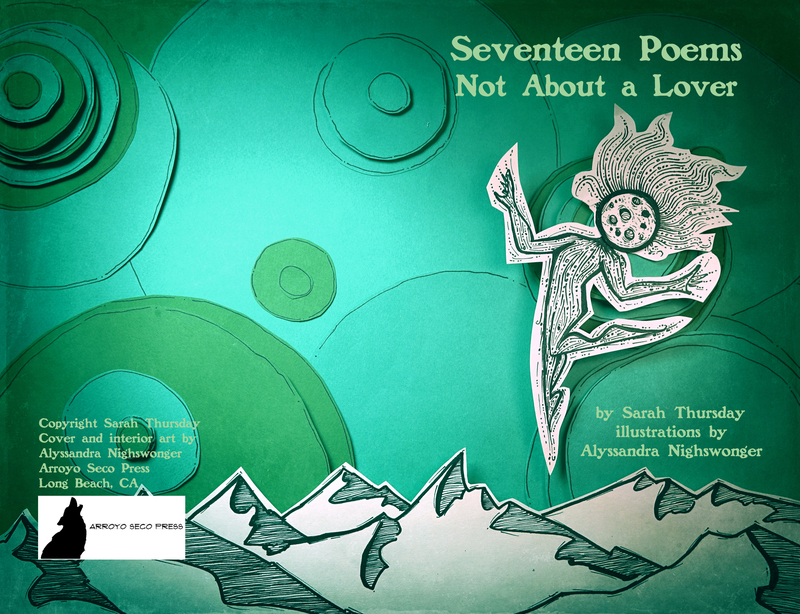 17 poems written by Sarah Thursday with lovingly crafted, paper-cut art for each poem by Alyssandra Nighswonger. Sunday, April 29th from 4 to 6 pm at Viento Y Agua Coffeehouse, 4007 E. 4th St., Long Beach, CA. There will be guest poets, art, and books! Details TBA. Sarah Thursday was born, in part, from inspiration found in her collaborator, Alyssandra Nighswonger. After six years of friendship and artistic crushing, this dream project has come to life. In addition to writing poetry, Sarah founded Sadie Girl Press to help publish local and emerging poets and artists. She ran a poetry website called CadenceCollective.net, co-hosted a monthly reading with G. Murray Thomas, but still wants to find new ways to bring poetry and art into her community. She has been published in many fine journals and anthologies and received a 2017 Best of the Net nomination. Her first full-length poetry collection, All the Tiny Anchors, and her other chapbooks and CDs are available at SadieGirlPress.com. Find and follow her to learn more on SarahThursday.com, Facebook, Twitter, or Instagram.